We are two games into the 2018-19 preseason and the Toronto Maple Leafs have secured back-to-back victories over the Ottawa Senators. While seeing teams back on the ice is always a fun sight in the preseason, the real fun involves the battles between players to earn a roster spot. The Maple Leafs have one such battle brewing between Josh Leivo and Tyler Ennis. Leivo played on Tuesday night in a 4-1 victory over the Senators at Kraft Hockeyville in Lucan, Ontario. He recorded four shots on goal and registered a minus-1 after being on the ice for the opening Senators goal by Ryan Dzingel. Both men are trying to convince Mike Babcock they deserve a spot on the fourth line, and Ennis’s impressive performance has him in contention for the position. But with six preseason games remaining, there is still time for Leivo to prove himself and take the spot for himself. For the sake of clarity, taking a look at both players could give us some idea as to whom will ultimately win out in this brief, but intriguing, position battle. 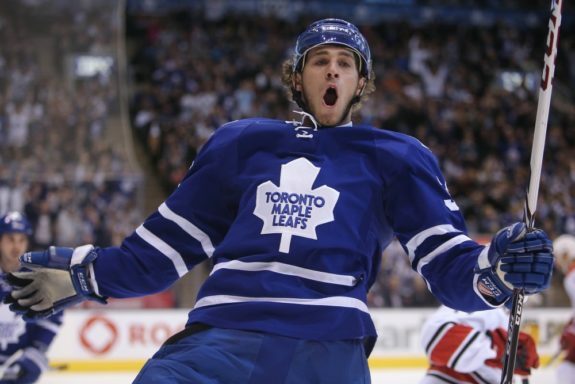 Beginning with Leivo, he was a third-round selection by the Maple Leafs in the 2011 NHL Entry Draft after playing with the Sudbury Wolves in the OHL (he also played for the Kitchener Rangers after being drafted). The 25-year-old has played 171 games for the Toronto Marlies in the AHL, posting 124 points (0.73 points per game) with an additional 27 points in 35 playoff games for the Marlies. He has played in only 55 games for the Maple Leafs, recording 22 points in that time, with 16 games and four points coming last season. In his career he has averaged 10:51 in ice time per game and has 33 takeaways and a shooting percentage of 11.6 percent on 86 shots—decent numbers despite the small sample size. One large difference between the two players is their height and weight. Leivo is 6-foot-2 and weighs a whopping 210 pounds, a massive figure compared to Ennis, who is 5-foot-9 and 161 pounds. Babcock likes having taller players to throw in his lineups (Matt Martin, for instance, is 6-foot-3 and 220 pounds) and Leivo could fill the large hole that Martin left after being traded to the New York Islanders. His more analytic numbers say he could be a solid piece for the Maple Leafs as well, such as his 2.7% career relative Corsi. He would also be a nice addition in a defensive capacity, like last season where 69.9% of his zone starts were in the Maple Leafs’ defensive end. If Babcock is looking for a stable defensive presence with some offensive upside, Leivo could be who he goes with when the regular season begins. 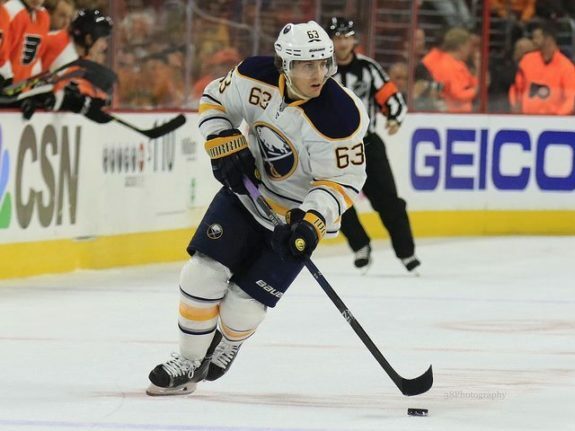 Signing a one-year, $650,000 contract over the summer, Tyler Ennis was selected 26th overall by the Buffalo Sabres in 2008 after racking up 236 points in 245 games for the Medicine Hat Tigers in the WHL. He saw action in 419 games with Buffalo, scoring 236 points (0.56 points per game) and recording five-consecutive 30-plus point seasons from 2010-15. He averaged 17:00 in ice time per game and shot 10.1 percent on 967 shots during his eight seasons with the Sabres. Possession-wise, he had a relative Corsi of 0.4 percent with the club; while not a great number, he was otherwise a solid winger for the team. Ennis’s production earned him a five-year, $23-million deal prior to the 2014-15 season, but unfortunately, injuries would begin to plague him, including surgery to repair his groin in November 2016. He played in only 74 games during his final two seasons with the Sabres, putting up just 24 points. He was eventually traded to the Minnesota Wild, with whom he played 73 games last year, but only saw 11:58 of ice time per game, the lowest of his career. He tallied 22 points on Minnesota’s fourth line, which was seemingly not enough production for the Wild, as they bought out his contract on June 30 this offseason. He would sign with the Maple Leafs one week later. In the NHL, Ennis has shot 9.7 percent on 1,079 shots, dished out 400 hits and scored 258 points. If he can bring the same physicality and knack for scoring to the Maple Leafs’ fourth line and gain some of the steps he has lost due to injuries, Ennis could win the spot easily. Unfortunately there really isn’t a contest in this battle; Ennis is going to win the spot by the end of the preseason. He has a surplus of experience in the NHL, something Leivo doesn’t have the luxury of, and he has proven he can score in bunches. The Maple Leafs don’t need a 40-point scorer on their fourth line (although that wouldn’t be a bad thing) but a 20-to-30-point player like Ennis would be perfect for the role. Leivo may be younger and have a higher ceiling, but with how Babcock has barely used him over the last few years, it’s unlikely he will beat out Ennis for the job. Look for No. 63 to be on the wing of the fourth line once the regular season begins.